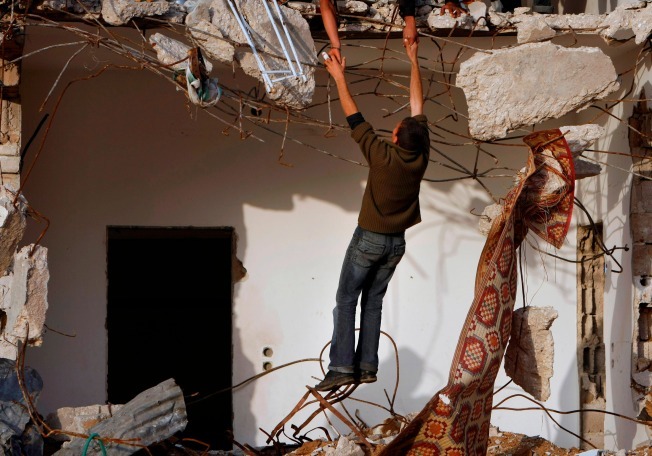 A Palestinian is pulled up by a friend into the remains of a damaged house from last month's Israeli military offensive. JERUSALEM - The United States plans to pledge more than $900 million to help rebuild Gaza after Israel's invasion and strengthen the Western-backed Palestinian Authority, a U.S. official said on Monday. The money will be channeled through U.N. and other bodies and will not be distributed via the militant group Hamas, which rules Gaza, said the official, who spoke on condition of anonymity as U.S. Secretary of State Hillary Clinton plans to make the announcement next week at a Gaza donors conference in Egypt. Clinton is set to visit Israel and the West Bank next week after attending a conference in Cairo on Gaza reconstruction, Israeli and Palestinian officials said Monday. Clinton will arrive in Israel on March 2 for two days and will meet with the country's top leaders, the Israeli officials said, speaking on condition of anonymity because the visit has yet to be announced by the State Department. Clinton will also be visiting the West Bank to meet Palestinian officials, according to Yasser Abed Rabbo, a senior aide to Abbas. In another development, Prime Minister Ehud Olmert dismissed Israel's top negotiator in Gaza truce talks for publicly criticizing his demand that Palestinian militants hand over a captured Israeli soldier before any deal is clinched, officials said Monday. The move threatens to roil the talks just weeks before Olmert is succeeded by the hawkish Benjamin Netanyahu, who wants Gaza's Hamas rulers toppled and likely would take a tougher line in the Egyptian-brokered truce negotiations. A truce deal has implications beyond cementing the informal Jan. 18 cease-fire that ended Israel's war on Hamas. Without it, there is little chance of advancing already troubled talks to reconcile feuding Palestinian factions. Olmert abruptly announced last week that Israel would not reopen Gaza's long-blockaded borders — the main Israeli concession sought by Hamas — unless Hamas-affiliated militants first freed Sgt. Gilad Schalit, who was seized in a June 2006 cross-border raid. Amos Gilad, the fired negotiator, opposed linking the truce deal with Schalit and criticized Olmert's strategy in an interview last week with the Israeli newspaper Maariv. After Gilad refused to apologize, Olmert gave him the boot, aides said Monday. "Due to the inappropriate public criticism leveled by Mr. Gilad, he cannot continue as the prime minister's envoy to any political negotiations," Olmert's office said in a statement. Aides said the talks would not be affected. A longtime adviser to Olmert, Shalom Turgeman, will replace Gilad in the truce talks, while veteran negotiator Ofer Dekel will handle efforts to free Schalit, the aides said, speaking on condition of anonymity because of the sensitivity of the talks. There was no immediate reaction from Gilad or Egypt. Hamas shrugged off the development, with spokesman Fawzi Barhoum saying Israel "never intended to reach any agreement or closure on a truce or a prisoner exchange." Hamas desperately wants Israel and Egypt to reopen Gaza's borders, which were sealed after the Islamic group's fighters violently seized control of the territory nearly two years ago. But it has rejected any linkage between a prisoner release and the truce negotiations. In related news, Al-Qaida's No. 2 leader warned Palestinians in Gaza against accepting a truce with Israel in an audio message posted on extremist Web sites, an Internet monitoring service said. Osama Bin Laden's deputy, the Egyptian-born Ayman Al-Zawahri, described the truce negotiations as "plots and conspiracies" to defeat the Palestinians after Israel's "aircraft and artillery" failed, according to a transcript provided by the U.S.-based SITE Intelligence Group. Bin Laden issued his own audio message on Gaza last month, urging Muslims to launch a holy war against Israel. Al-Qaida holds little influence among Palestinians, but its Gaza-related postings are likely meant to harness Muslim anger elsewhere over the Israeli offensive. The Israeli military launched the three-week assault on Hamas after years of Gaza militants firing rockets into southern Israel. The sides declared separate cease-fires Jan. 18, but sporadic violence has persisted. Two rockets struck Israel on Monday and an Israeli aircraft fired missiles at a vehicle belonging to militants preparing an assault, the military said. No injuries were reported in any of the incidents.